Recent advances in technology have forever changed the way sports fans around the world access live events. Demand for the online streaming of live sports events is already huge and still growing at an exponential rate. Pay-Per-View (PPV) streaming meets the needs of this market and offers extremely lucrative potential for investors, developers, and promoters. One of the biggest markets for live online sports streaming and PPV is combat sports. Ever since 155,000 people paid $10 each to watch Roberto Duran defeat Sugar Ray Leonard in 1980, PPV and combat sports have gone hand-in-hand. In 2007, some 2.4 million people paid to watch Oscar de la Hoya fight Floyd Mayweather, while wrestling and MMA have also attracted PPV audiences in excess of 1 million. Muaythai is another potentially very lucrative PPV market with a fast-growing global audience, but it has still not been fully exploited. There remains a need for more high profile international muaythai events and TV productions to meet demand. To capitalize on this huge potential, EB has developed an online streaming platform. EB-TV is on target to become the number one online platform for combat sports. 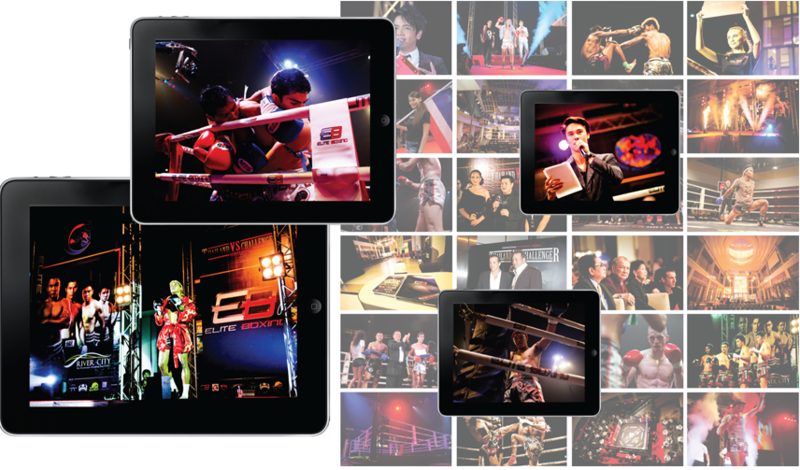 Featuring the very latest in streaming technology, EB-TV includes a huge library of video-on-demand, PPV live events, news and interviews, magazine shows, a massive online community, and separate channels dedicated to different promoters allowing them to monetize their content through various revenue streams, including PPV, video-on-demand, advertising options, TV syndication, and online gambling. With over 100,000 page views per month and rising, EB-TV is already on target to become the world’s number one online platform for combat sports and martial arts events. The constantly growing video-on-demand libraries are available 24 hours a day, while the online community ensures that visitors are always kept engaged whenever they visit the site. The news, interviews and magazine shows not only keep the visitors informed and entertained, but are also used as marketing tools to generate interest in upcoming PPV events. On the EB-TV platform, promoters can also set up their own branded channels allowing them to monetize their content through various revenue streams, including PPV, video-on-demand, advertising options, TV syndication, and online gambling. Easily publish online, mobile, and social videoin real-time. Rapidly deliver an interactive mobile video experience without custom development. Reach audiences anywhere - on your website,the social web, and mobile phones. Engage online and mobile audiences more deeply and in multiple ways through advanced social and interactive features. Converge your online, mobile, and social presence into a single branded community. Monetize online and mobile audiences and increase premium video ad inventory. Deliver live and on-demand content to any device. Promoters please contact Sales at [email protected] for information on producing shows with EB-TV.